“Call Of Spiritual Duty” from Christian Faith Publishing author C.S. Lizarde provides answers for the questions left unanswered. “Call Of Spiritual Duty” reveals some of the wizards behind the curtain and the truths they do not want the People to know. “Call Of Spiritual Duty”: a revelation in an era defined by intentional confusion. 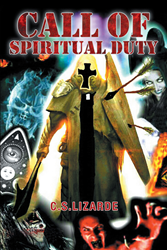 “Call Of Spiritual Duty” is the creation of published author, C.S. Lizarde. Growing up on the streets of North Visalia, California, Carlos Lizarde quickly became familiar with life’s hardships and untimely trials. When Carlos began to apply the Biblical keys to his life, he noticed immediately that opportunities and blessings began to shift in his favor. Published by Christian Faith Publishing, C.S. Lizarde’s new book offer answers for a time defined by misdirection and untruths. Now is the time for the Faithful to open their eyes and remain vigilant. Soon, the day will come when the revival will become an inevitability. In these times, the world is challenged by constant darkness and despair. Headlines, which call wicked acts good and good teachings false, sweep across the nation, causing terror and confusion. One must question if there is some “wizard” behind the curtain controlling this madness. In “Call Of Spiritual Duty,” readers will find some, if not all, of the answers they have been seeking. Where there is truth, “Call Of Spiritual Duty” reveals it. Join this open letter to the nation as the pages reveal some of the wizards behind the curtain and the truths they do not want the People to know. View a synopsis of “Call Of Spiritual Duty” on YouTube. Consumers can purchase “Call Of Spiritual Duty” at traditional brick & mortar bookstores, or online at Amazon.com, Apple iTunes store, Kobo or Barnes and Noble. For additional information or inquiries about “Call Of Spiritual Duty”, contact the Christian Faith Publishing media department at 866-554-0919.